WISHING A VERY HAPPY LOHRI AND MAKAR SANKRANTI TO ALL THOSE WHO CELEBRATE! Of all the halwas that my mother used to make, this was my least favorite. 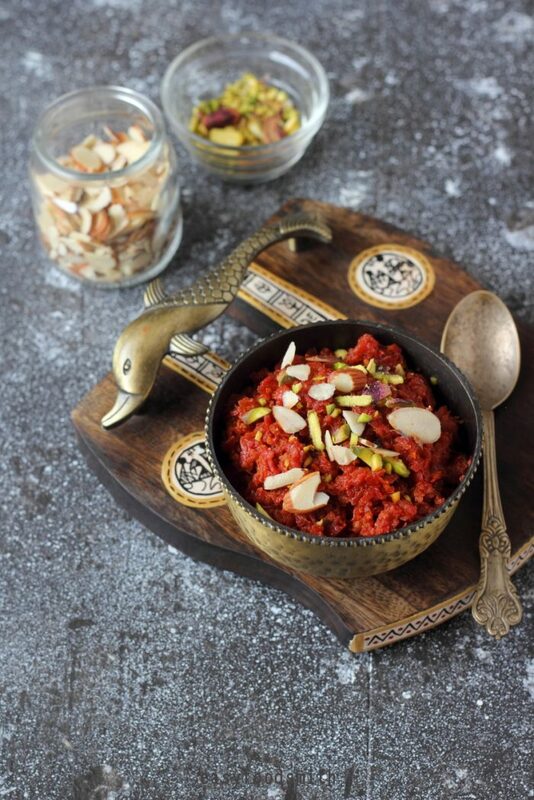 Everyone, from our extended family to all my friends, would gorge on her gajar halwa except me. In fact, as a kid, I found the thought of eating carrots absolutely revolting. To ensure that I receive the goodness of this Vit-A rich food, my mother would indulge me with apple, beet and carrot juice to which she would add some black salt & root ginger juice. The colour of beets, the sweetness of apples would make the juice palatable for me and I used to gulp it without any fuss or complains. 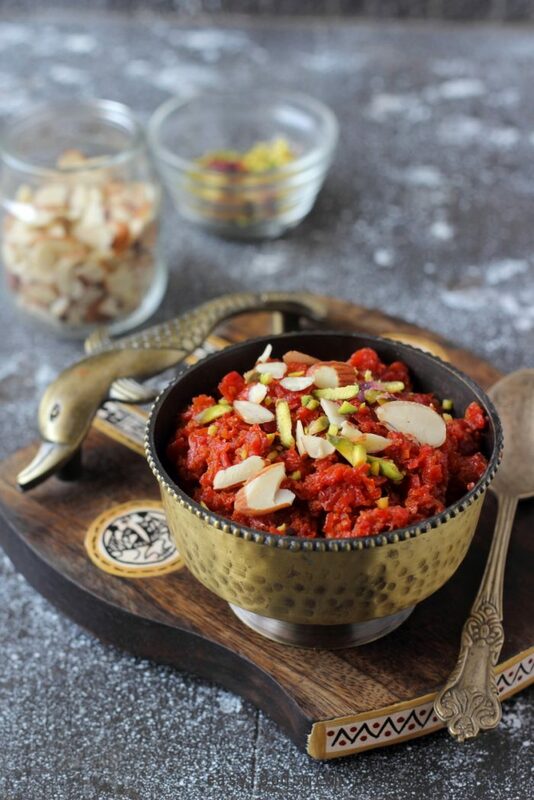 Win win situation..
Now, I love to make and eat this halwa which is a seasonal delicacy. It is diligently made a few times during the winter season. I find the whole process of making the halwa almost therapeutic, enjoying every step of slow cooking it and how it eventually turns into this beautiful aromatic dessert. So few ingredients and such an amazing dish. Boil the milk. Reduce the heat to lowest and allow the milk to simmer. 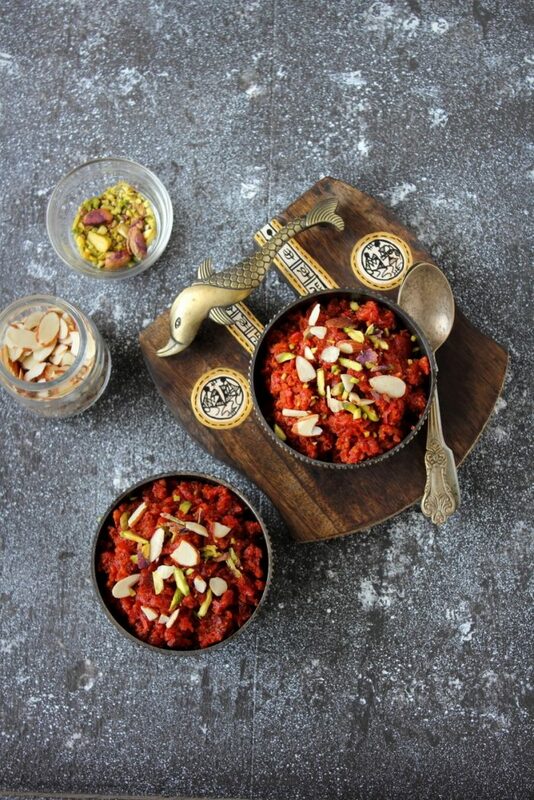 Remove a few teaspoons of milk in a small bowl and mix in the crushed saffron. Set aside. While the milk is simmering, peel, wash and shred the carrots. Place a large, heavy bottom pan (I use a wok/ kadahi) on heat and add grated carrots. To cook the carrots in milk, add the milk to the carrots in three installments. Add one third of the milk to the carrots and cook the carrots on high heat, stirring often, till they absorb the milk. Add milk and repeat the process twice again. Reduce the heat and add the jaggery and keep cooking on low heat. Stir now and then to prevent it from catching at the bottom. 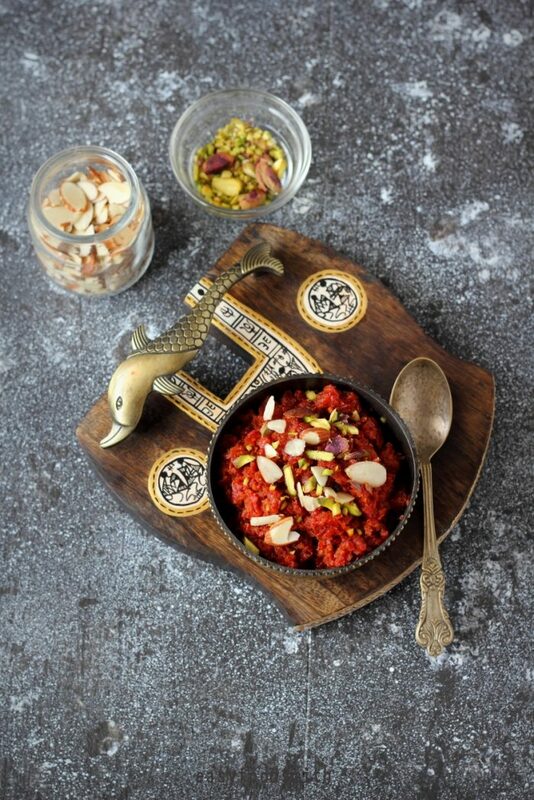 I have never had carrot halwa…looks so inviting and delicious! Thank you so much Angie 🙂 I hope you give it a go. What a gorgeous color. I’ve never had a carrot pudding but there is always a first time. The spices you use always inspired me to break out of my box and try new things. This pudding is one to try. Certainly a pudding to try. It is delicious and healthy dessert. And so good in winters. This is a must have dessert in winters and I especially wait for red carrots to make it. True! Winters are incompletely without certain foods. 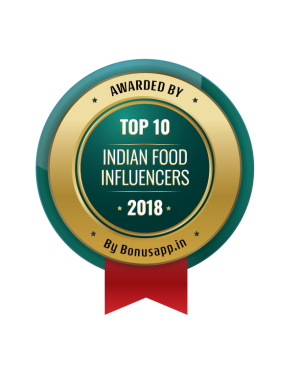 Thank you so much 🙂 I am sure your gajar ka halwa must have been delicious!